After United's twelve year association with Adidas came to an end, the Club went with a new manufacturer for the 1989/90 season, Japanese Sportswear Manufacturers ASICS. The main design of the kit was similar to the previous seasons' Adidas effort, with a diagonal pattern and shirt manufacturer’s logo throughout the top, enhanced with an occasional double horizontal stripe. Again, a black V-neck collar and black cuffs were used, with a single tangerine line included. Dunbar based brewery firm Belhaven also continued their shirt sponsorship deal for a third year, with the same striking white and black Belhaven logo that had been on the shirts for the previous year. The Club's lion rampant crest that had been introduced to the shirts in 1983 also remained. However, a main change to the design was the inclusion of black and white triangular panels on both shoulders, the first time that white had been included in the Home shirt since 1969 (excluding badges and sponsor logos). The shorts were black, with white and black triangular panels on each side. The socks were tangerine with black trim, and included a white sole. 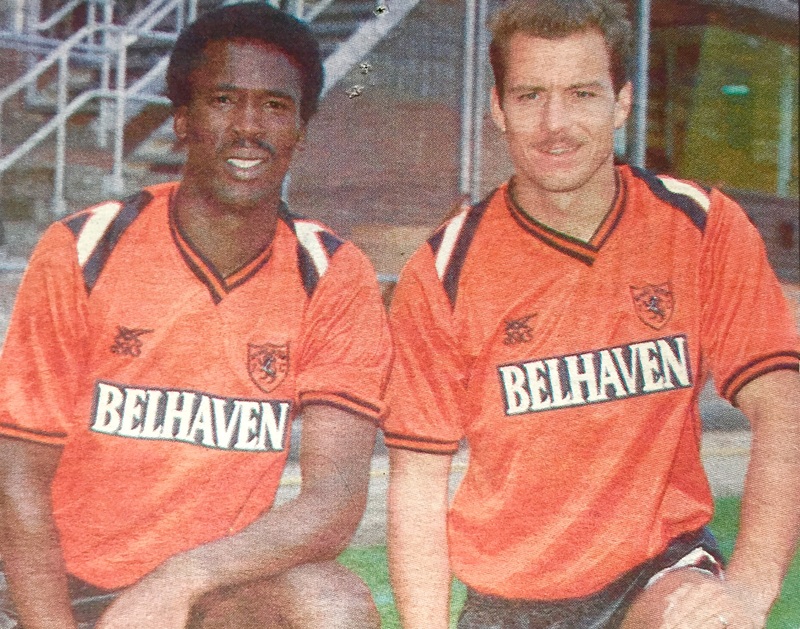 The first competitive match that the Home strip was worn was the opening game of the 1989/90 season, where United drew 1-1 with Motherwell at Tannadice. A shock exit to Hamilton Accies in the League Cup and a 4-0 hammering by Aberdeen in the Scottish Cup Semi-Final did not improve on a League campaign that saw United finish in 4th place for a second consecutive season. 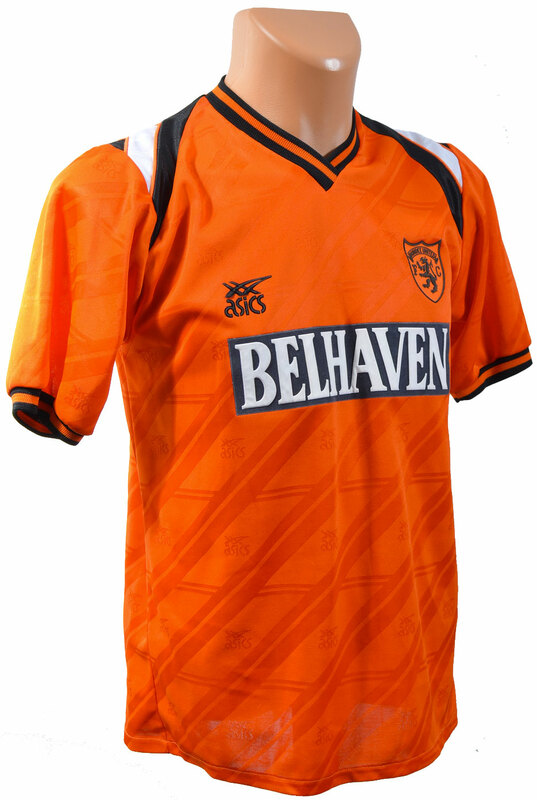 Used again throughout the 1990/91 season, the final competitive game using this Home strip was the 0-1 defeat to Dunfermline at East End Park in May 1991. This defeat meant United had failed to qualify for Europe through League position for the first time since 1976, and were now reliant on winning the Scottish Cup Final against Motherwell.